Get outdoors at Cockrell Butterfly Center and Hermann Park. Head to Houston Premium Outlets and Memorial City Mallfor plenty of shopping. Explore the numerous day-trip ideas around Houston: Old Town Spring (in Spring) and Kemah Boardwalk (in Kemah). There's lots more to do: stroll through Houston Zoo, get curious at The Houston Museum of Natural Science, explore and take pictures at Minute Maid Park, and test your team's savvy at popular escape rooms. For ratings, maps, reviews, and more tourist information, read Houston route builder . If you are flying in from Singapore, the closest major airports are George Bush Intercontinental Houston Airport and William P Hobby Airport. In June in Houston, expect temperatures between 39°C during the day and 28°C at night. Wrap up your sightseeing on the 18th (Tue) early enough to travel back home. On the 19th (Wed), witness a stunning natural landmark at Old Faithful, don't miss a visit to Artist Point, and then take in breathtaking views at Grand Canyon of the Yellowstone. 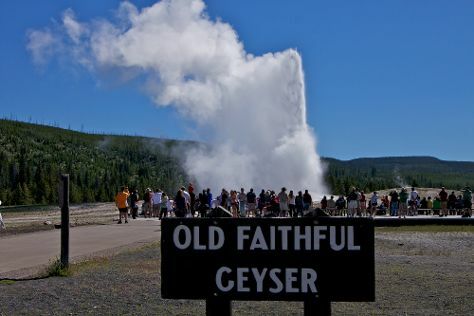 On the 20th (Thu), you'll have a packed day of sightseeing: explore the striking landscape at Lower Geyser Basin, then witness a stunning natural landmark at Grand Prismatic Spring, then witness a stunning natural landmark at Solitary Geyser, and finally witness a stunning natural landmark at Daisy Geyser. To see traveler tips, maps, and tourist information, read our Yellowstone National Park road trip planning tool . Traveling by combination of flight and car from Houston to Yellowstone National Park takes 7.5 hours. Alternatively, you can do a combination of flight, shuttle, and bus; or drive. You'll gain 1 hour traveling from Houston to Yellowstone National Park due to the time zone difference. Expect colder temperatures when traveling from Houston in June; daily highs in Yellowstone National Park reach 22°C and lows reach 1°C. 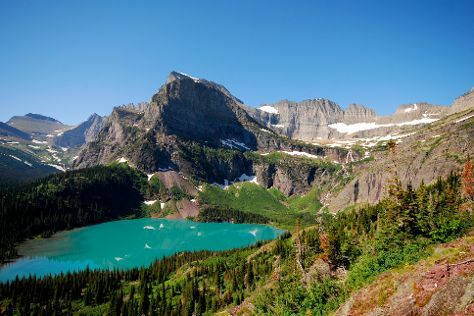 Wrap up your sightseeing on the 20th (Thu) to allow time to travel to Glacier National Park. Kick off your visit on the 21st (Fri): appreciate the views at Logan Pass, take a memorable drive along Going-to-the-Sun Road, and then admire the sheer force of Virginia Falls. Keep things going the next day: trek along Iceberg Lake Trail, then hike along Highline Trail, and then take in the dramatic natural features at Grinnell Glacier. To see reviews, other places to visit, ratings, and tourist information, read our Glacier National Park trip builder app . Do a combination of car, flight, and taxi from Yellowstone National Park to Glacier National Park in 8 hours. Alternatively, you can drive. Traveling from Yellowstone National Park in June, things will get a bit warmer in Glacier National Park: highs are around 28°C and lows about 8°C. On the 23rd (Sun), wrap the sightseeing up by early afternoon so you can travel back home.